conceived, reasonably priced” of existing cruising designs to their own creations. This presented formidable competition for similar vessels of that era--the Moodys, Pearsons, Bristols and Endeavors. According to a cruising boat dealer of the mid--to late ‘80s, "They knocked our socks off and grabbed a huge market share." Caliber did this by covering all the bases in design and construction and then marketing the Caliber to a niche market: the knowledgeable, quality-conscious customer wanting complete packages, ready to sail away into the sunset. A glance at recent classified ads for "loaded" 1995 and 1996 Caliber 40LRCs (sloops with Caliber’s Convertible Cutter Rigs) launched in the past two years reveals prices consistently between $220,000 and $225,000. The base price for the original 40 was $154,000 in 1994. An ad for a ‘95 40LRC reads, "Absolutely mint, very well equipped, ready to go anywhere." We believe it. So many details have been incorporated into Michael McCreary’s design to ensure their boats stand up to the test of the sea miles/time that all this boat asks is to be well sailed and it promises to take care of the rest. 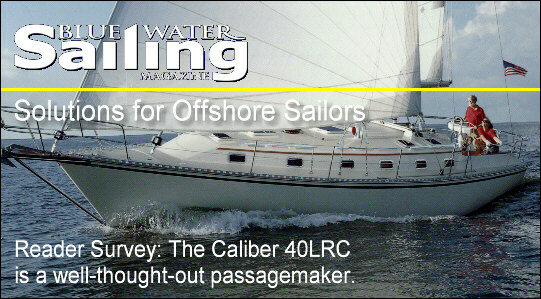 lot of thought has gone into the conception, construction and marketing of the Caliber 40LRC(Long Range Cruiser). That’s your overriding thought as you study the plans and exhaustive product information provided by Caliber Yachts, Inc. of Clearwater, Florida. Owners of this boat who cruised through the Blue Water Sailing Subscriber Survey appear to be in complete agreement. Says one: "A well constructed boat, interestingly conceived, reasonably priced." Caliber entered the cruising boat scene in 1981 with the launching of the first Caliber 28, which was built by George and Michael McCreary in a backyard garage. By 1985, the McCrearys were operating out of their own plant in Clearwater, which produced the Caliber 33, to be followed in 1987 by the 38 and, in 1991, by the 35 and 40, modification of the 38 with extended stern and swim platform. After introducing the Caliber 30 pocket cruiser, the McCrearys’ launched their LRC (Long Range Cruiser) series with increased fuel and water tankage for long-distance cruising.